I'm headed down to San Diego this weekend to celebrate one of my best friend's 30th birthday. We're going wine tasting, so it's safe to say that I'm pretty freakin' excited about it. Who doesn't love a little wine during the day?! What are y'all doing this weekend...anything special? Happy Cinco De Mayo! I hope you guys are celebrating in typical fashion by enjoying a margarita or two. In honor of the day, I collected some interior photos with a Mexican interior style. 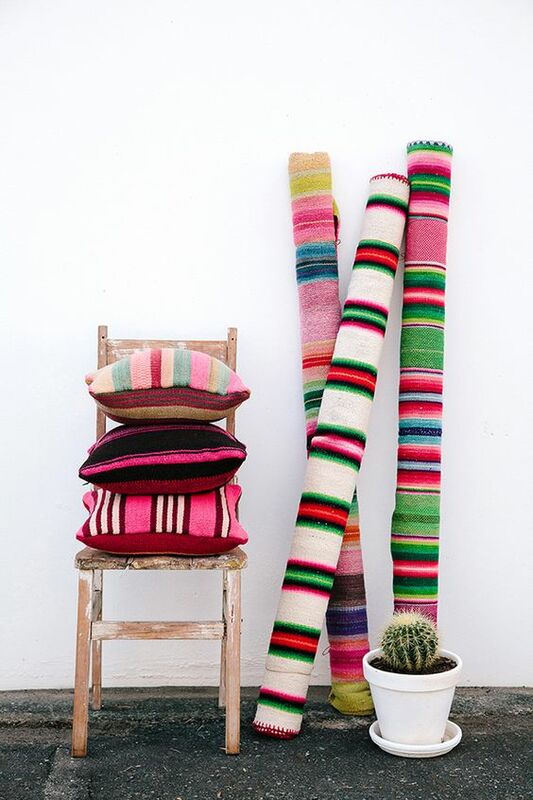 Get yourself some textiles that are bold, striped, and full of color to bring a little Mexican flavor to your own home. Now go and enjoy those margaritas!! 1 tequila, 2 tequila, 3 tequila, floor...hopefully your floor is full of brightly colored Mexican pillows. Ha!